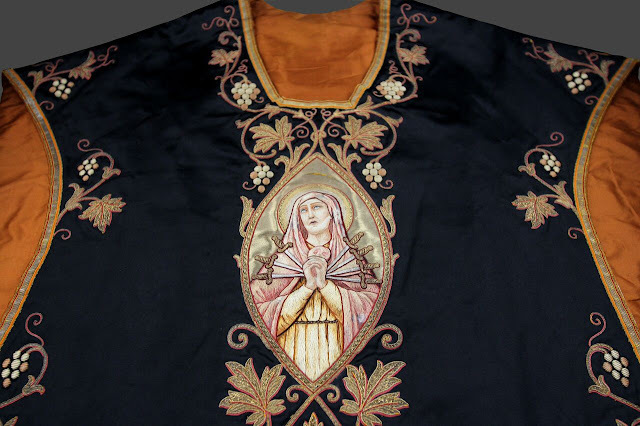 Earlier this month, we shared some delightful pre-20th century black vestments, all set about with bones and skulls and reminding us of our mortality: all very appropriate and full of teaching. 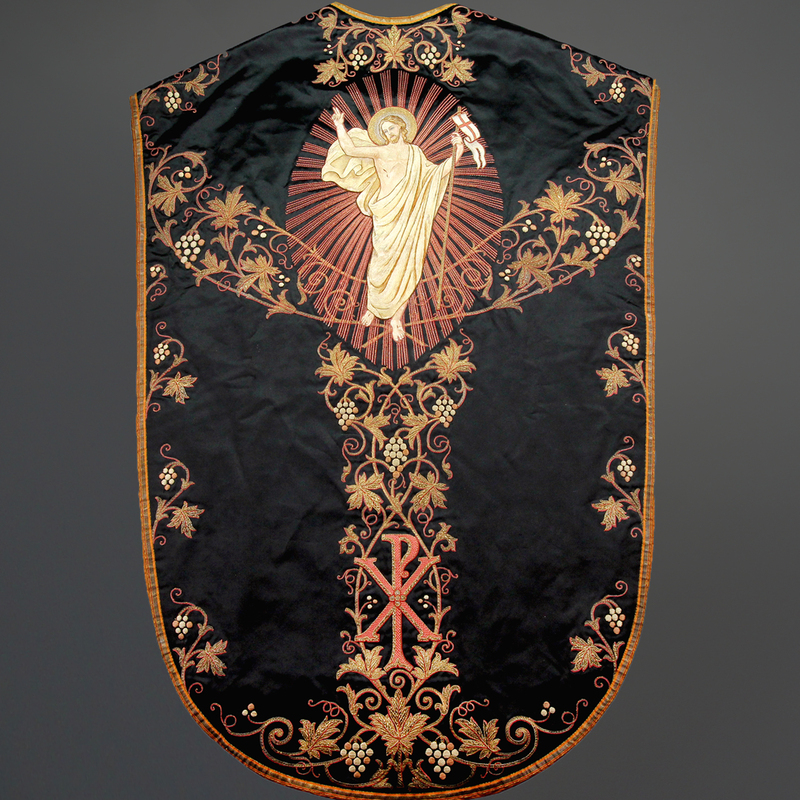 I would like to share with you another set, which I came across in our vestment archive here at Watts, and which has been showcased on our Facebook page, along with several other black sets. Do pop over and have a look. This chasuble dates from the earlier part of the 20th century, probably France or Belgium and is hand embroidered using a couple of different methods. I suspect it dates from between the wars: the Liturgical Movement is in full swing, and the Chi Rho, so beloved of the movement adorns the base of this set. 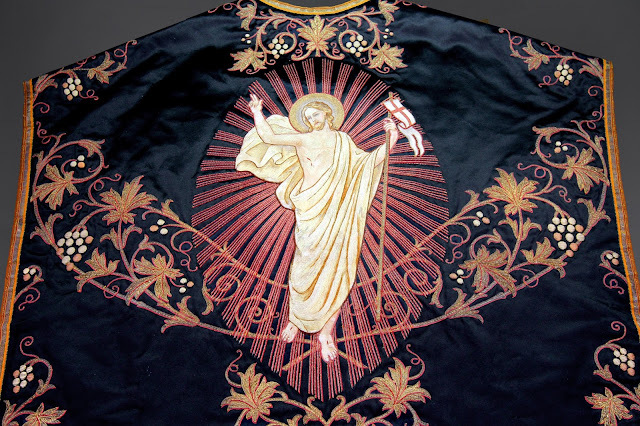 What sets this chasuble from other Requiem vestments is that it depicts the Resurrection. When you think about it, this is obvious: where there is death, there is hope in the Resurrection. This is possibly a large part of the reason that for the last 50 years white has been favoured at funerals for many. But white misses the point; white assumes salvation without purification; white assumes there is nothing to be gained in praying for the soul of the departed. White also denies us the opportunity to grieve. The older form of the Requiem is one long cry of grief: the Church consoling her children but weeping with them. What could be more appropriate, therefore, than to depict on the front of this set Our Lady of Sorrows? She stands at the foot of the Cross and grieves for Her Son. She did not doubt Him, but She had lost Him. This chasuble sets the Resurrection on to a Cross: a Cross made of vine leaves. We are saved through the Precious Blood of Christ pouring from the sacrifice of the Cross and of the Altar. In a way this chasuble could only have been made in the aftermath of the First World War. Until this present age people had been exposed to death in a way in which we no longer are. But nothing like the scale and horror of the First World War: how can anyone make sense of the death of 20 million people in the space of four years without the hope of the Resurrection? This was a generation who needed no memento mori in the traditional sense: what good would pictures of skulls do them, when they had only to think of their brothers, fathers, uncles, friends; all lying in Flanders Field (or places very like it). This was the generation who began to celebrate three Masses on All Souls day, a permission granted in the face of a very real need to offer the Holy Sacrifice: the only thing that really responds to the madness of that slaughter: and in the midst, the hope of the Resurrection.